Anxiety can be difficult to identify when comorbid with breathing difficulties because its symptoms overlap those of obstructive and restrictive disorders. However, untreated anxiety can lead to poor outcomes for both conditions so needs urgent attention. With the news always reporting negative events, frequently reporting violent, emotionally-charged stories it is perhaps unsurprising that rates of anxiety in society, in general, are increasing. The function of anxiety, biologically-speaking, is however, adaptive, as it is designed to enable us to respond quickly and effectively to danger or threat – known as “fight or flight”. However, anxiety can, unfortunately, persist in the absence of a need to react to danger and so can interfere with daily functioning and ultimately compromise our health. For example, evidence indicates that those suffering from anxiety are at increased risk of developing a variety of long-term, serious medical conditions. In addition, illness can be exacerbated by anxiety: despite research being in its infancy, evidence of the inter-relationship between emotions and physical functioning is growing. Sadly, however, anxiety is often overlooked despite research indicating that untreated anxiety results in worse treatment outcomes for the medical condition it relates to. Breathing difficulties such as chronic obstructive pulmonary disease (COPD) and asthma are commonly associated with anxiety. Under normal circumstances, difficult breathing results from strenuous activity; but where the extent of difficulty seems out of proportion to the exertion, then it is appropriate to be concerned. Most physical causes of shortness of breath (dyspnea) result from disorders of the respiratory and cardiac systems, with lung disease being the most common cause. The problem typically stems from an airflow obstruction (obstructive disorders) or problems with lung expansion (restrictive disorders). Each of these disorders means the person has to work harder with each breath and reduces the amount of oxygen that can be absorbed on inhalation. Having some anxiety when you have a chronic disease can be adaptive in that it may encourage you to be compliant with treatment, be aware of symptoms and become expert at knowing when and when not to seek help. However, it can also become dysfunctional and mean you become a frequent visitor to medical services or also withdraw from normal daily living and especially avoid activities that may lead you to feel breathless. In COPD, inflammation of the airways is worsened by a loss of elasticity in the lungs, with the result being that not only is it more difficult for air to reach the lungs, but they neither fill nor expel air completely. So people with COPD struggle to breathe or feel short of breath; and unsurprisingly, this symptom is a powerful trigger for anxiety, as it would be for those without COPD. In fact, COPD patients are much more likely than people without to experience panic attacks and panic disorder. Anxious feelings may also be triggered when thinking about having a progressive lung disease, or you may worry about having an episode of difficult breathing in the future. Those who have asthma experience difficulty breathing, tightness in the chest, and attacks of wheezing. Extreme cases can cause perspiring, increased pulse, and severe anxiety. Asthma symptoms result from the narrowing of the airways and constriction of respiratory muscles owing to inflammation, swelling, and mucus accumulation. Asthma attacks are generally triggered by allergies but can also be caused by illness, exercise or stress. It may become habitual to anxiously anticipate the next attack, and this fear can actually increase the likelihood of it happening, as well as making the attack last longer. 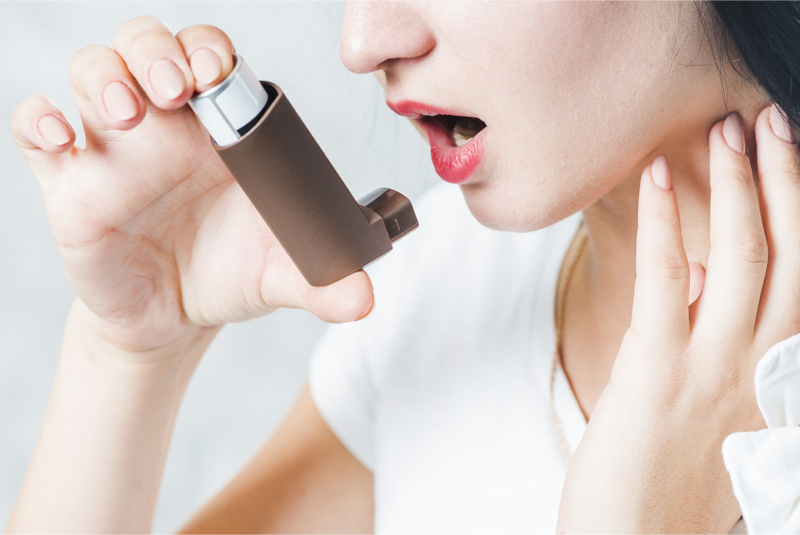 40 percent of people report that stress is a trigger for asthma attacks; and this is a prime example of a physical disorder that can worsen significantly due to anxiety or panic. Anxiety and breathing difficulties often create a cycle of breathlessness. Feeling unable to breathe can understandably provoke panic, which can make you feel more anxious and can make it even harder to breathe. If you get caught up in this breathlessness-anxiety-breathlessness cycle, you may have difficulties distinguishing the symptoms of anxiety from the symptoms of COPD or asthma. People may also inhibit their activities when they are ill or may be unable to perform daily activities or fulfill expected roles, and this can also result in feelings of anxiety. Cigarette smoking, which is thought to be one of the causes of COPD, has also been strongly linked to anxiety symptoms as the nicotine in tobacco is a stimulant; likewise, there are high rates of smoking among some asthmatics. In addition, some medications for COPD (beta-agonists and theophylline-containing drugs), can also increase anxiety and panic symptoms. Anxiety can be difficult to identify and treat because symptoms of anxiety can frequently overlap with COPD and asthma symptoms. However, anxiety symptoms that are ignored have negative consequences on physical functioning and social interaction and often increase those with dyspnea's use of health services. It is increasingly recognized that COPD sufferers with co-morbidities tend to be more frequently hospitalized and are at increased risk of premature death in comparison with COPD patients without additional difficulties. Anxiety is one such co-morbidity that contributes substantially to the burden of COPD-related morbidity, primarily by impacting upon their quality of life and lessening treatment adherence. Although results vary, the majority of studies report high rates of anxiety symptoms and panic attacks in those with COPD, with women being at higher risk than men. In studies on COPD patients, anxiety has been connected to more frequent hospitalization and with greater distress at all levels of lung function. So even when anxiety doesn't shape how the disease progresses, it certainly shapes the quality of life. A recent study asserted that COPD patients are 85% more likely to go on to have an anxiety disorder in comparison compared with healthy individuals; furthermore, the rate of clinical anxiety in COPD outpatients has been as much as 46%. More severe COPD (measured using the COPD Severity Score and BODE Index), was found to be associated with a greater risk of anxiety. Poor control of asthma has also been connected with increased levels of anxiety. Surveys have found that anxiety symptoms may be present twice as often in asthmatics compared to patients without. A study that was using the Hospital Anxiety and Depression Scale (HADS) found that almost one-third of asthma patients experienced anxiety at clinical-disorder level, double that found in the general population. As with COPD, anxiety is more prevalent in women than in men with asthma and also increases with age. What can you do if you have COPD or asthma and anxiety? Make use of peer-support and psychological support services which are increasingly being made available to those with chronic health complaints. Many people with COPD and asthma find that individual psychotherapy enables them to reduce their anxiety considerably. Group therapy and peer-support groups can also be very beneficial when it comes to learning how to cope with breathing difficulties and anxiety - being with others confronting similar issues can be supportive and empowering. Becoming an expert in your condition seems to be one of the most beneficial strategies as it enables you to increase your sense of mastery and control which cognitively serves to reduce the tendency to feel anxious. In addition, the more you understand your condition, the easier it is to get it under control. In the pursed-lip breathing method, you position your lips as if about to whistle and breathe out slowly through pursed lips to a count of four. This technique keeps the airways open for longer, enabling the removal of air trapped in the lungs by slowing down your breathing rate and relieving shortness of breath. In addition, deep breathing techniques such as Buteyko breathing can increase asthma control. This technique enables you to reduce the volume and number of breaths you take. Deep breathing exercises seem to assist with reducing asthma symptoms and use of rescue inhalers, as well as lowering medication doses, and improving quality of life.